After an amazing number of difficulties over the last year Modern Slavery #3 has now been published and is in the process of being distributed. It should be showing up on newsstands throughout North America by now. It has been most recently delayed by the closing and bankruptcy of what was until recently the largest magazine distributor in the US, SOURCE-INTERLINK. However, we have arranged for alternative distribution to replace most of the sites lost with the final extinction of Source-Interlink, and subscription copies are also now being shipped! This project is looking great. I love Anarchy magazine (AJODA) and its nice to see another great project from you all. Great to see Bob Black back in print again. It’s been quite a while. But you should hear what his old girlfriend, Sue “Popular Reality” Poe, says about him! Scandalous! Truly a rogue in many, many ways. Any updates on when issue 3 might come out? I can’t wait to read it. 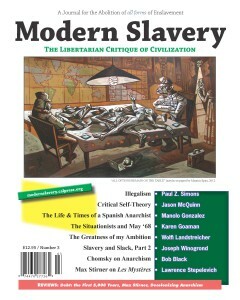 So much good stuff coming out lately with Modern Slavery and the new English translation of Stirner’s Critics. 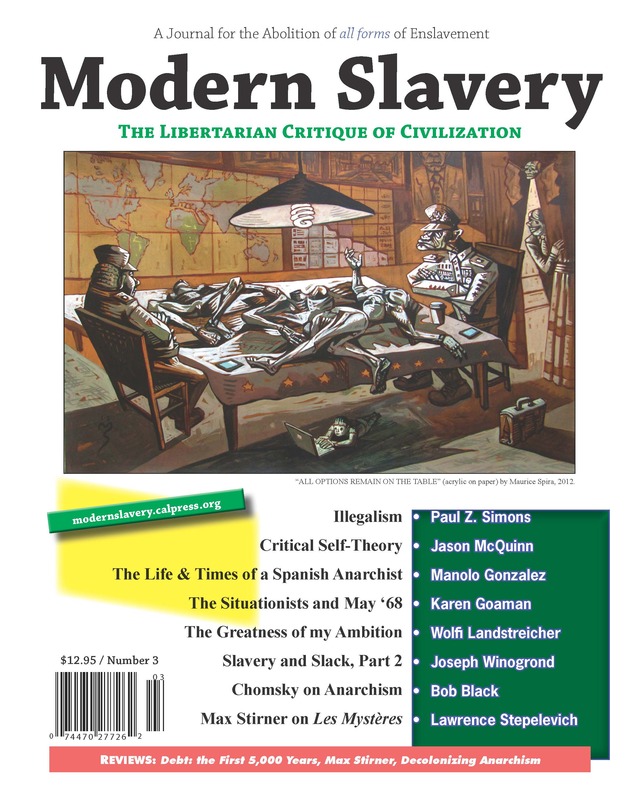 We’ve had all the material ready for Modern Slavery #3 since the fall of 2013, and we only need to finish up the layout for the issue to go to press. We’re hoping that this will only be a matter two or three weeks now, so look for issue #3 to be out around the end of February or in March, 2014.
i wish yu guys could have given yourselves permission to do some more BALANCED layout ways! Say, some so-called “shoddy” layout PLUS whatever “professional” (?) layout you already had done!. And calling for local creative folk to lead, too, with BOTH (or more, as they dare speak) of our camps’ ideals in mind! We will do more variegated layout in the future. But with only me doing the layout up until now, I can only do so much. Watch for changes. I’d be seriously sad if Modern Slavery shuts down & all subscriptions are canceled. I’ve got the full subscription the first four issues, and I’m looking for the third issue every time I check my mail. Looking forward to many more issues. Great to hear this is being sent out. Can’t wait for issue #3. Thanks for taking on this project! Just picked up no. 3 from the local B&N. Many interesting things. I am drawn immediately to Bob Black’s take on Noam Chomsky’s (lack of) anarchism. I once offered a lengthy defense of Chomsky against Zerzan. Not interested in doing that this time around, even if I could. Lots to read. Lots to chew on. Very appreciative that you guys are still around doing this stuff. Frankly, without it, it would be hard to even notice there are attractive alternatives to the statist outlook (which in its most benign forms is often attractive given the suffering I see in the world).